Go beyond traditional dog training. Hit play above to learn how. Enjoy fun & freedom with your dog! No more boring, repetitive training sessions. Building a soulful connection with your furry best friend gives you all of this and so much more. You don't need another obedience training class. You need to transform your bond. Want help training your dog so that you forge a soulful connection? Using only positive, fun dog training techniques that build your relationship instead of destroy it. Having a guilt-free relationship with your best friend. ...and the chance to enjoy so much more together. You just need the right approach...one that moves beyond training and creates connection. What would you love to do with your dog? The only limit is your imagination. How do you dream of being with your dog? What would life be like with the companion you’ve always longed for? You chose to live with your dog because you wanted to enjoy time spent together. But with all the misinformation out there in the dog training world, sometimes it just feels more confusing and frustrating than anything else. It doesn’t have to be that way. You can live with your dog in peace and harmony. All it takes is understanding, love, and trust — and the world can expand for both you and your dog. Transform your relationship with your dog into the bond you’ve always dreamed of having – regardless of where you are today. I provide in home private dog training classes to clients in and near Greenville, SC. It’s the ideal alternative to a dog training and boarding school. Your best friend stays with you, you bond with each other, and your dog learns to listen to you, not just the trainer. We use dog-friendly techniques that help you learn to understand and bond with your canine family member, so the training is fun, not to mention life-altering. Or, want to start right now, working on your own? Get your free guide to Soulful Connection here. By the time my clients get to me, they've usually already worked with at least one other trainer -- sometimes more. Because of that, I see the heartache and pain caused by traditional dog training techniques. I've walked down that road; I know where it leads. And through my experiences, I've come to believe in a different, more positive training approach: one that centered around love, understanding, and communication -- not dominance, guilt, and control. I believe that dogs are often a bridge for us, between our true selves and the outside world. They've always been for me. It is my mission to help people build that bridge based on trust and true connection, no matter what they've been taught in the past. Unleash the power of your dog's full potential. Learn more about how Horizon Dog Training's positive, professional dog training services can help you and your dog. I was born into a life with dogs. 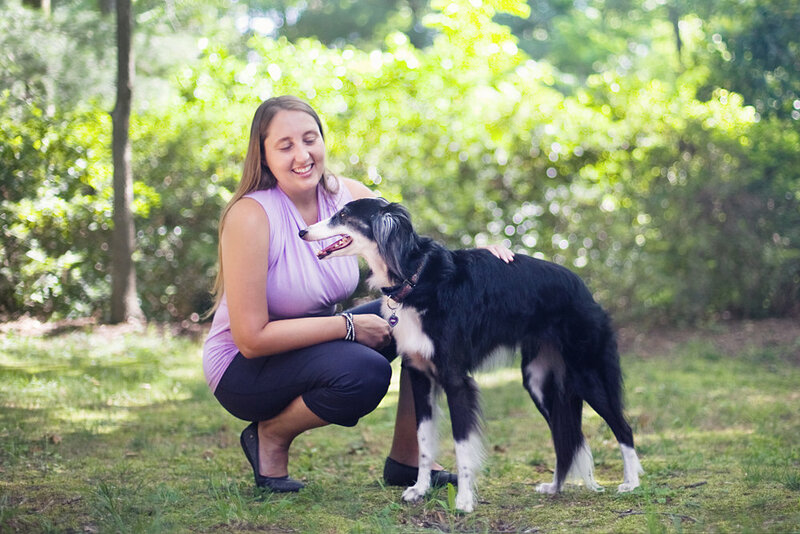 My journey has taken me from my childhood home on a rural farm to countless amazing adventures in the wider world, finally ending where I am now: a Certified Canine Behaviorist working with dogs and their families in Greenville, SC. I've seen dogs give amazing gifts to people, and I know they can save lives and heal us. As a K9 Handler for Search and Rescue, and I learned to trust and communicate with my dogs when human lives were on the line. Working animal assisted therapy, I've leveraged the special bond we have with dogs to reach kids who were lost in their own pain. I've seen the other side, too. I've rehabilitated dogs with severe behavioral disorders, teaching them to trust and connect again. I've trained pet dogs in loving homes to restore the bond with their owners once it had been broken. I've seen the magic that can exist between dogs and humans. Read my story..and meet my dogs. 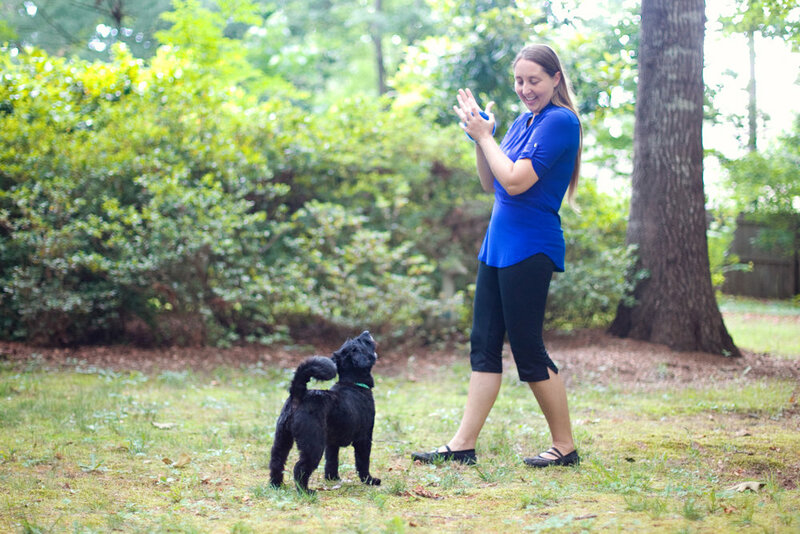 Positive, Professional Dog Training for the Greenville, SC area. Online Consultations also available to other locations.